Update Oct 2013 – Datastream variables for GICS (Global Industry Classification Standard) added. Researchers often want to select companies based on their industry or sector. There are a variety of systems for classifying industries/sectors: SIC codes, ICB codes, GICS codes … For more detail see post on Industry classification codes. 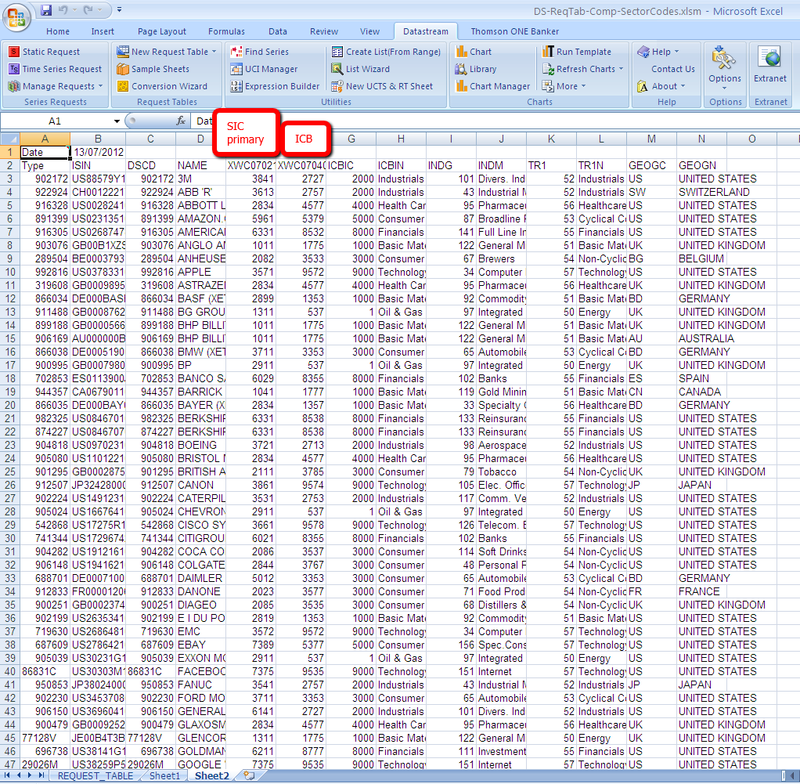 This Datastream AFO sheet shows a static request to get a variety of industry/sector codes. Note: This is not a complete list of all industry/sector codes available in Datastream. The Datastream results illustrated above were created using a company sector codes Datastream request table – see Datastream Request Table post for more information. Using datastream, how can I find the SIC code for each company? Industry codes are static (i.e. only one value) so you need to use a Datastream Static request, rather than a time series request. I’d recommend doing a test request with smaller constituent list (e.g. LFTSE100 ) before trying to get results for a large list of equities/companies. The primary SIC code is available as variable WC07021 – other secondary SIC codes are also available. SIC code WC07021 is part of Worldscope and so will only be available for equities/companies covered by Worldscope. SIC codes come in US and UK versions – I think Worldscope uses the US one but check the definition to be on the safe side. 1) SIC code 1, SIC code 2, SIC code 3, SIC code 4, SIC code 5, SIC code 6, SIC code 7, SIC code 8. 2) Product segment 1 – SIC code, Product segment 2 – SIC code, Product segment 3 – SIC code and so until Product segment 10 – SIC code. 1) The SIC codes 1 to 8 are part of the company header information, static data items so only current/latest values are available. 2) The Product segment SIC codes are part of the product segment data. This may only be available for companies that report multiple product segments in their accounts. However, where it is available you should be able to get annual time series data. Thank you for your comment. I have now another question on SIC codes in Thomson One. As you said previously SIC codes in Worldscope accessed through Datastream are only current/latest values. How about Acquirer Primary SIC code/Acquirer SIC codes and Target Primary SIC code/Target SIC codes in data downloaded from Thomson ONE (previously known as SDC). Are they given for that year when acquisition was announced or also current/latest values as in Worldscope? The SIC codes assigned to the Acquirer or Target in the SDC database (or ThomsonOne.com deal) are the SIC codes used at the time of the transaction.